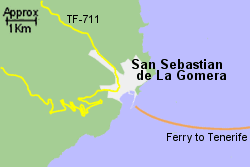 Map of the San Sebastian de La Gomera Port area. 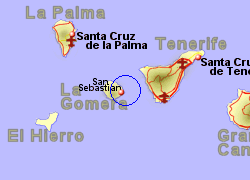 The capital of La Gomera, San Sebastian, has a small port which together with the airport, approximately 12km to the south west, are important for communications with the island. 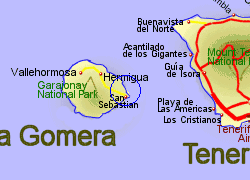 The roads on La Gomera tend to be narrow and winding. 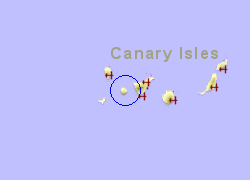 To cross the island to Valle Gran Rey, just 20Km as the crow flies, is 50Km by road and will take over an hour by car. There are bus services crossing the island. Also operated by Armas with up to 3 crossings per day, crossing time 1hr.